Contains the Center-angle of the 2006 Galletta's Klassic 150 from September 23rd, 2006, the rain-shortened September 30th, 2006, and 75-lap race from October 7th, 2006 at Galletta's. Price $5 each. Contains the September 16th, 2006 race and the Tower angle of the 2006 Galletta's Klassic 150 from September 23rd, 2006 at Galletta's. Two camera angles available. Price $5. 2006 Volume 15 DVD (containing the Non-point October15th, 2006's Non-Winner & Regular 40-Lapper races is available per specific order. Please request it personally through me for $5. Contains a higher-resolution version of the September 3rd, 2006 and the September 10th, 2006 races at Galletta's. Two camera angles of each race. Price $5. 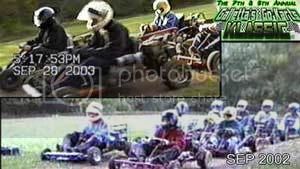 Contains the August 27th, 2006 and a low-resolution version of the September 3rd, 2006 races at Galletta's. Two camera angles of each race. Price $5. Contains the August 20th, 2006 races at Galletta's. Two camera angles of each race & extras. Price $5. Contains the August 13th, 2006 races at Galletta's. Two camera angles of each race. Price $5. Contains the August 6th, 2006 races at Galletta's. Infamous "tie" race. Two camera angles of each race. Price $5. Contains the July 30th, 2006 races at Galletta's. Two camera angles of each race. Price $5. Contains the July 23rd, 2006 races at Galletta's. Two camera angles of each race. Price $5. Contains the July 16th, 2006 races at Galletta's. Two camera angles of each race. Price $5. Contains the July 9th, 2006 races at Galletta's. Two camera angles of each race. Price $5. Contains the July 2nd, 2006 races at Galletta's. Two camera angles of each race. Price $5. Contains the June 11th, 2006, June 18th, 2006 and June 25th, 2006 races at Galletta's. Two discs contains highlights from 2006 and on. Two camera angles of each race. Price $5 each disc. 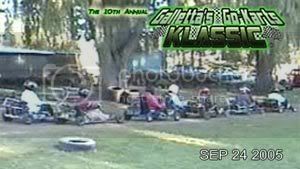 This 2-disc set contains the Galletta's Go-Kart Klassic Championship 150 from September 23rd, 2006! Each disc has a different camera angle of the same race, and as a bonus, the race before and two races after. The entire 2006 season is available via request ($5 per disc)! Price $10 (2 discs). 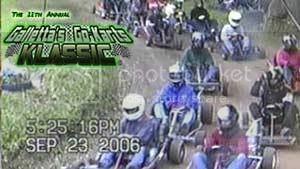 This disc contains the Galletta's Go-Kart Klassic Championship 125 from September 26th, 2004! Includes bonus coverage from other races. Price $7. 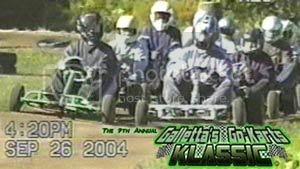 This disc contains TWO Galletta's Go-Kart Klassic Championships from September 2002 and another from 2003! Includes bonus coverage from other races. Price $7.